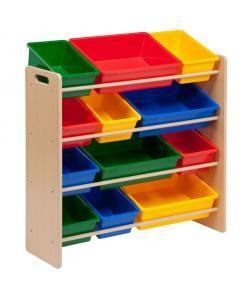 This useful 4-tier toy organiser by KiddyPlay is great for storing toys, stationery, clothing and more. 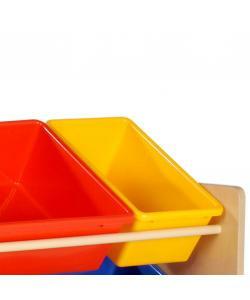 The removable containers are made from high quality, strong plastic and come in 2 sizes and 4 classic colours. Rounded safety corners on the frame and containers and the floor supports increase safety. Surfaces are durable and stain resistant. 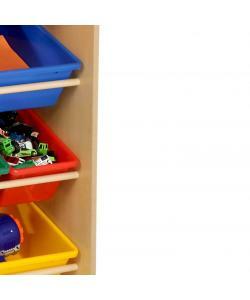 This wood frame organiser has 12 plastic bins of varying sizes to keep everything tidy. 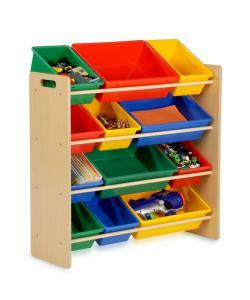 It’s the perfect organiser for playrooms, bedrooms, even their bathroom! The colourful bins make organising fun and easy. Some assembly required.